This publication illustrates how data sharing can improve access to valuable data, which would otherwise remain locked away in corporate siloes or within sectors. A data-sharing checklist guides organisations through the main areas for consideration as they work towards a solution. It is aimed at organisations that have identified the opportunity to create value through sharing data and are considering setting up arrangements for data sharing. Several key practical challenges are discussed, including data management, integration and linkage. The engineering components required to enable data sharing are conceptualised in a diagram of a data-sharing system. The importance of improving access to data through data sharing is recognised by government in its Digital Strategy and in the Artificial Intelligence (AI) Sector Deal. This report explores the policy context for data sharing and draws out implications for policy. A series of 10 case studies, across a range of applications and sectors, shows how organisations and people have come together to share data under controlled conditions, and how value is created as a result. The case studies explore challenges around business models, technical design and data curation, and legal and commercial arrangements. Data sharing has existed in specific sectors and contexts for many decades, although limited by the amount of data available and the number of players involved. New technologies and digitisation have dramatically increased the type and volume of data available. The capability to collect and analyse static and real-time data, along with reduced storage and processing costs, has opened up the potential to create significant new value with and across industries and sectors. New approaches are emerging that facilitate controlled data sharing. These approaches help to break down data silos and enable access to data and associated data services that add value. They need to address commercial, legal, regulatory, ethical and technological challenges, and require new workforce skills. Data sharing generally refers to the exchange of data between two or more organisations, occurring in one or more directions. There may or may not be a financial transaction associated with this exchange. Reciprocal arrangements sometimes exist, whereby participants share their data and in return receive similar data from other organisations. The exchange of data usually comes with conditions about where and how the data is used, for example. Raw data, augmented data, derived data or a solution based on data may be shared. Data sharing can also refer to the integration of data-based operations between two or more organisations. A vital element in creating value from data is a robust information management approach, where the business requirements are clearly set out, and the relevant data that meets the requirements is assembled, structured and managed over its lifecycle. If data sharing is required, the question of how data will be integrated or linked is also key. If the information management is done well, less resource will be needed to share data effectively. These aspects are discussed further in the practical challenges section. 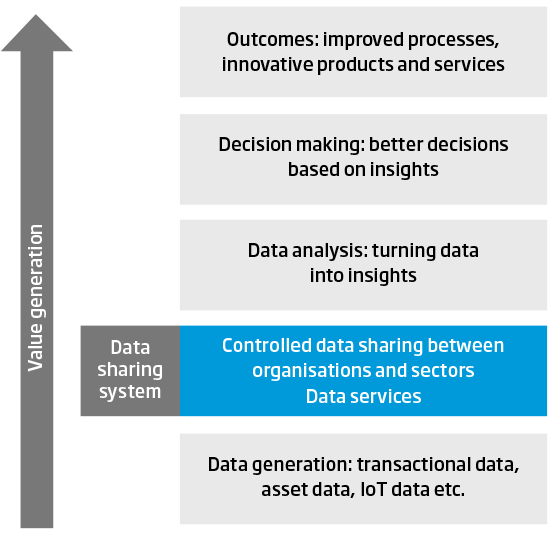 Data sharing is part of the ‘data value chain’ (Figure 1), which describes how value increases as data shared and transformed into insights, leading to better decision-making, improved processes, and the development of innovative products and services. The potential for data sharing is one of many considerations when an organisation investigates whether the relevant data is available to meet business requirements. 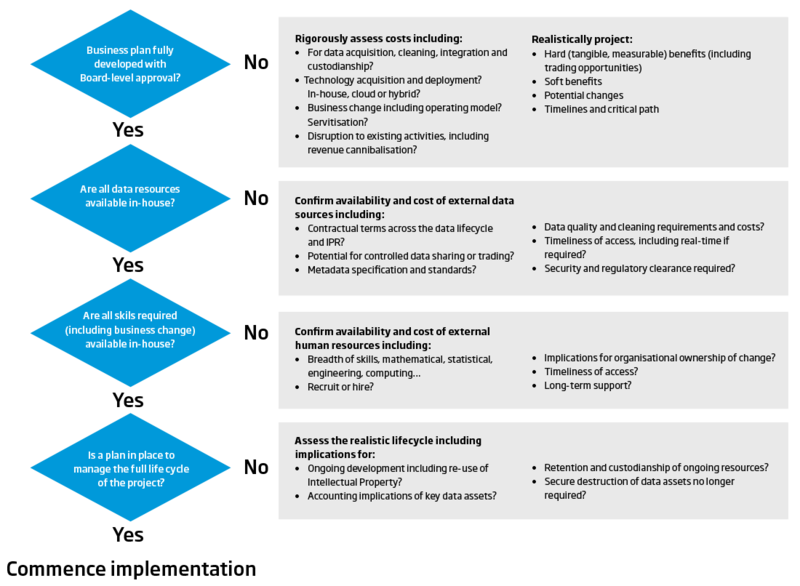 A project decision tree for data-enabled business change (Figure 2) sets out key points in the decision-making process, and indicates where considerations about data sharing occur in that the process.